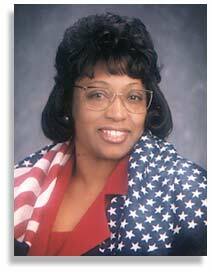 Congresswoman Corinne Brown was elected to Congress in 1992 and represents the Third Congressional District of Florida. When Congresswoman Brown was elected it was the first time since Reconstruction that Florida sent an African American to Congress. She is an active member of the Congressional Black Caucus, the Women's Caucus, the Human Rights Caucus and the Progressive Caucus. The interview was conducted (by phone from San Diego) for In Motion Magazine by Nic Paget-Clarke, April 16, 1999. For more information see: The History of Affirmative Action Policies. In Motion Magazine: I understand that Ward Connerly is bringing his anti-affirmative action campaign to Florida? In Motion Magazine: What level of support is he receiving? Congresswoman Corinne Brown: I know that he's not receiving support from the various parties, the Democratic Party nor the Republican Party. My understanding is that the Associated General Contractors are paying him. We started looking up statistics and they get 98 percent of the work - so what they want is a guaranteed 100 percent? That's not going to happen in this state. In Motion Magazine: Do you know the position of Governor Jeb Bush? Congresswoman Corinne Brown: The Governor has come out against Connerly's proposal. In Motion Magazine: The mayor of Miami? Congresswoman Corinne Brown: I'm sure the mayor of Miami is against it. And the Mayor of Jacksonville has indicated to me that he is against it. In Motion Magazine: Has affirmative action been successful in Florida? Congresswoman Corinne Brown: In some areas. As far as contracts go, in the Miami area it works extremely well. In the Orlando area it works extremely well. People are getting portions of the services that they pay their taxes in to. Minorities are participating. In Jacksonville it's very small. Less than one percent. Beneficiaries all over the state have been white females. They get two to maybe three percent of the contracts. Minorities and Blacks get less than one percent. White males get the rest of the pack. So I wonder what are we talking about? In Motion Magazine: Is this campaign by Connerly only about affirmative action and contracts, or will it involve education also? Congresswoman Corinne Brown: It's across the board. In Motion Magazine: Have you heard of any reactions from students? Congresswoman Corinne Brown: Yes I have. Groups have contacted me and I've heard from some college presidents. They have programs to increase diversity that they have worked hard for and they want to make sure they stay in place. You will see a broad spectrum of the community coming together to fight this kind of discrimination. In Motion Magazine: Are there any organizations forming at this time. Congresswoman Corinne Brown: Yes, the Urban League is leading the effort here in Jacksonville. They are bring various groups together. Also, I have contacted Mrs. King because one editorial in a Jacksonville paper has dared to compare what Connerly has done in California and Washington to what Dr. King has done. Mrs. King has agreed to come to Jacksonville for a kick-off rally. In Motion Magazine: How do you see this particular battle fitting in to the national struggle over affirmative action? Congresswoman Corinne Brown: I think that he's picked the wrong state. Nobody in this state is going to lay down and play dead, and let him come in with his play on words. If you call my home and ask me if I'm for discrimination I'm going to say no. But the right question is "Am I for inclusion?" Most people if they see the statistics, if they are educated to the facts, they understand that we don't want a system that is 100% for white males. White males don't pay 100% of the taxes. In Motion Magazine: How do you see the battle over affirmative action within the context of the civil rights movement in the United States. Congresswoman Corinne Brown: The thing that is most disturbing to me is that Connerly wants to take a tool and try to turn it against the very people that need the assistance. Let's look at Florida. I was one of the first three (African American) people elected in 1992 to the United States Congress in one hundred and twenty-nine years. A hundred and twenty-nine years! The percentage of minorities in this state is about 25 percent. Why did it take so long to get an African American elected? Because the system is not set up for inclusion. I tell students all the time when I speak, I didn't get here because I'm so great. Or I'm so cute. Or I'm so smart. I got here by the grace of God and I stand on the tall shoulders of other people who've gone over the bridge. Here this man, Connerly, has used the system to get where he is, and he would take up the bridge for other young kids. That is unacceptable to me. The principle is that we need to teach giving something back, giving people opportunity. To help. Connerly wants to take away these tools. In Motion Magazine: Is there anything else that you would like to say as this campaign gets launched? Congresswoman Corinne Brown: Connerly is being used. He is a paid carpetbagger and we are going to show who he and the people behind him are. I can tell you that those people, the Associated General Contractors, are not going to be participating in building my church. We are not going to do business with those people, people who up to now have been building churches in the Black community. Published in In Motion Magazine May 4, 1999.